Isabelle de Tomaso’s homebred Irish War Cry has been named 2017 New Jersey-bred Horse of the Year and champion 3-year-old male by the Thoroughbred Breeders’ Association of New Jersey. 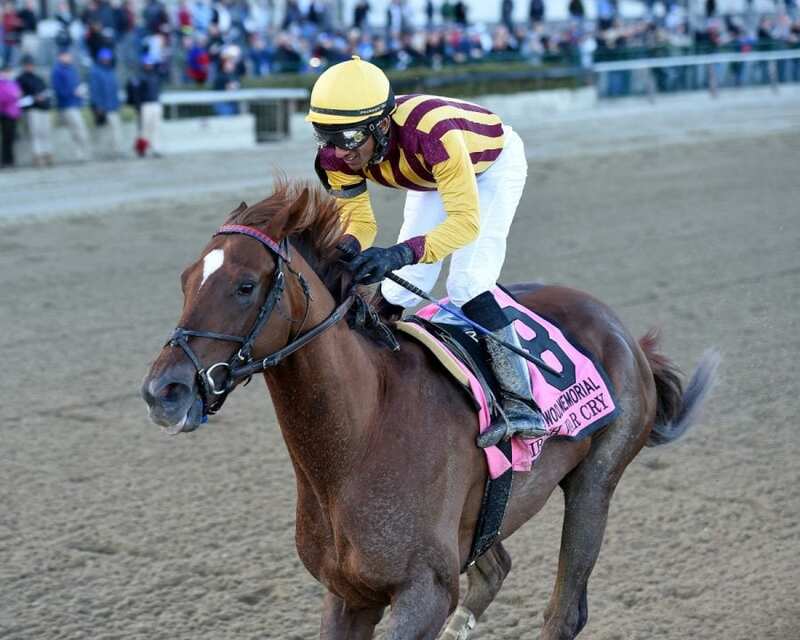 The son of Curlin out of the Polish Numbers mare Irish Sovereign was the leading New Jersey-bred money earner of 2017, having earned $966,660 from seven starts including victories in the Holy Bull Stakes (Grade 2) and Wood Memorial (Grade 2) along with a second place finish in the Belmont Stakes (Grade 1). Irish War Cry, trained by H. Graham Motion, has $1,049,460 in career earnings. Anthony and Gaston Grant’s Green Gratto was honored as champion older male and champion sprinter with victories in the Toboggan Stakes (Grade 3) and Carter Handicap (Grade 1) during his 2017 campaign. The Kaz Hill Farm bred son of Here’s Zealous out of Starship Smokester, by Smokester earned $351,834 in 2017 and has career earnings of $1,138,372. The seven-year-old is trained by Gaston Grant. Like What I See is the champion 2-year-old after winning the Colin Stakes at Woodbine on September 2, 2017.The gelded son of Bold Warrior out of the Lost Soldier mare, After the Applause, was bred by Hal Snowden, Jr. and made all six of her starts during his freshman campaign at Woodbine. Like What I See was purchased out of the Ocala Breeders’ Sales Company 2015 Fall Mixed Sale for $13,000. He is owned by Julianne Lewis, Martha K. Gonzalez, Richard A. Rizzo, & Ralph Klicker and is trained by Nicholas Gonzalez. Liz’s Cable Girl is the champion 3-year-old filly after winning five of her eight starts in 2017 for Lizabeth Dodd, John Cocce, Peter Donnelly, and Gerard Melley. This is the second consecutive year the mare Forbidden Isle has produced the New Jersey-bred champion 3-year-old filly after Diamond Play received the honor in 2016. Liz’s Cable Girl is a daughter of Cable Boy out of Forbidden Isle, by Belong to Me and won five races during her championship campaign by a combined 19 lengths. Liz’s Cable Girl was bred by Colonial Farms and is trained by Patrick McBurney. The champion filly earned $148,120 in 2017. Joseph & Gayle Ioia’s Bustin Out is the repeat winner in the older female division after winning three of her five starts in 2017. Dianne Boyken bred the daughter of Bustin Stones out of the Disco Rico mare Disco Shaker who won the Eleven North Handicap and finished third in the Regret Stakes and Pumpin Pie Stakes during her championship campaign. Bustin Out, trained by Chuck Spina, earned $107,920 in 2017 and retired with earnings of $354,132. A second Isabelle de Tomaso’s homebred, Irish Strait, was named champion turf runner after winning the Red Bank Stakes (Grade 3), a second place finish in the Monmouth Stakes (Grade 2), and a third place in the Tampa Bay Stakes (Grade 3). The five-year-old son of English Channel out of Irish Sovereign, by Polish Numbers earned $131,620 in 2017 under the direction of trainer H. Graham Motion. Irish Sovereign was honored as Broodmare of the Year for the second consecutive year in 2017. Isabelle de Tomaso owns the 18 year-old mare by Polish Numbers out of the Beau Genius mare, Irish Genius. Irish Sovereign has produced six winners from the six foals who have started including the 2017 New Jersey-bred Horse of the Year Irish War Cry and his older half brother Irish Strait who was honored as New Jersey-bred champion turf runner. Hey Chub is the Thoroughbred Breeders’ Association of New Jersey’s Stallion of the Year for the second time in his career. The 18-year-old son of Carson City out of Donna Doo by Spend A Buck was a multiple stakes winning New Jersey-bred hit the board in 30 of his 36 starts and earned $441,755. Hey Chub is the sire of 44 foals of racing age and 25 of his 27 starters have reached the winner’s circle. Hey Chub has sired Chublicious ($563,754), winner of the 2017 Frank J. De Francis Memorial Dash Stakes and and Chubble Maker ($285,077) along with stakes placed Chubbiana ($119,872). Hey Chub is owned by Daniel J. Lopez’s Joe-Dan Farm and his progeny have lifetime earnings over $2.5 million with average earnings per starter of $95,600. Voting for the 2017 New Jersey-bred Champions was conducted by columnist Bill Finley, Monmouth Park handicapper Brad Thomas, Daily Racing Form handicapper Kenny Peck, The Racing Biz founder and publisher Frank Vespe and Associate Editor of Thoroughbred Daily News, Ben Massam.